The last thing Cammie Morgan remembers is leaving the Gallagher Academy to protect her friends and family from the Circle of Cavan–an ancient terrorist organization that has been hunting her for over a year. But when Cammie wakes up in an alpine convent and discovers months have passed, she must face the fact that her memory is now a black hole. The only traces left of Cammie’s summer vacation are the bruises on her body and dirt under her nails, and all she wants is to go home. Once she returns to school, however, Cammie realizes that even the Gallagher Academy now holds more questions than answers. 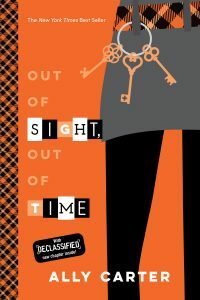 Cammie, her friends, and mysterious spy-guy Zach must face their most difficult challenge yet as they travel to the other side of the world, hoping to piece together the clues that Cammie left behind. It’s a race against time. The Circle is hot on their trail and willing stop at nothing to prevent Cammie from remembering what she did last summer.